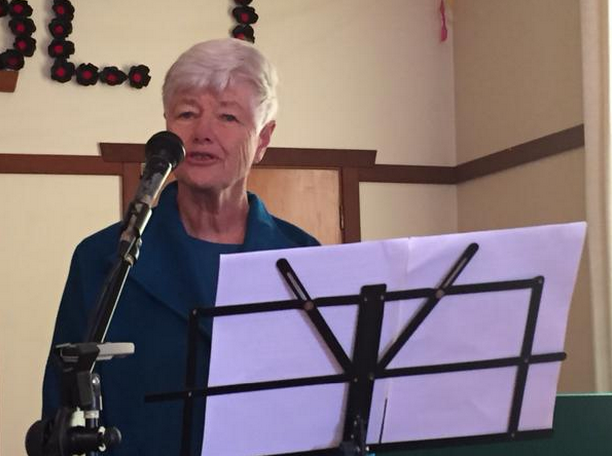 Jeanette Fitzsimons speaking in Blackball on Saturday. CANA was invited to speak about “The problem with the extractive industries”. You can read my speech here – I launched our 2015 Jobs After Coal report, with updated figures on last year. May Day is traditionally a celebration of the 40-hour week and the gains workers have made through union activity and solidarity. The latest example would be Unite forcing the end of zero-hour contracts with McDonalds. It was sad to hear Garth Elliott, EPMU organiser for the Coast, lamenting that these days the consumer society and TV have lulled many people into accepting the unacceptable or expecting the union to negotiate for them without the collective support of its members. I couldn’t help thinking the same forces lull us into accepting climate change, or expecting the government to look after us. Paul Maunder, conference organiser for a number of years now, began with an excellent definition of sustainability. I was looking forward to hearing Grant Robertson talk about their Future of Work commission to see whether Labour had taken on board the need for a Just Transition out of fossil fuels, but unfortunately he was not able to make it on the day. Neither was any MP of any party. There is a lot of support on the coast for developing a new economy that relies on clean energy and jobs that are locally owned and deliver what the community needs – energy, housing, food, transport – the Just Transition CANA argues for in Jobs After Coal. This was reflected in the record attendance for the day. There are also those who cannot accept that coal mining will not return and are just hunkering down waiting for the price to rise, but I sense their numbers are waning. Also waning are the numbers of jobs in the coal industry – our report found there are 111 fewer jobs this year in coal than last year. There’s no sign of the promised jobs at Denniston – and there are unlikely to be any time soon. And no, the last thing we’re doing is “dancing on the grave of coal” as the NZ Resources website thinks we are – we are extremely concerned about the future of a region that has been left to drift by a coal industry that clearly isn’t going to lift a finger to help. And of course there was the usual climate denier – a geologist and engineer who has worked in the coal industry, arguing climate change won’t be that bad, we can adapt to climate change, it has happened before, we can move around and grow different things from now, there is no proof, etc. If anywhere in NZ could be expected to argue this, given the pain the coast is experiencing from coal layoffs, it is here, but there was virtually no support in the room. A volley of counter arguments erupted and we moved on. The public is ready for new, bold ideas but generally their elected leaders are not offering them. An exception is the Mayor of Buller who is trying a number of projects to provide alternatives for his community, the hardest hit by layoffs at Stockton, where another “restructuring” is expected this week. He thanked CANA for our contribution in Jobs After Coal and wants to keep in touch. But there is still no sign of the “Everyone round the table” Just Transition process that would ensure full community buy-in. The Mayor of Greymouth said a sustainable future should be based on expanded coal mining. I hope he reads chapter 2 of our report that goes into the grim outlook for coal. The regional council did not address sustainability but their plan is open for submissions at the moment – and I hope they get them. The West Coast Development Trust (DWC) didn’t address sustainability either, and put forward no concrete ideas. They seem mainly concerned to preserve the value of the capital they have – the $92 million given to the Coast to help with economic development in 2000 when the logging of old growth indigenous forests was stopped. They run some training and business development programmes but their own administration costs $2-3 million. Everyone we talked to who had ideas and projects complained that you can’t get money from DWC for innovative ideas that would create jobs. So, the new extractive industry the West Coast seems to need today is a way of extracting some of the people’s money from their Trust, some of whose members are elected, to finance a just transition away from coal, away from fossil fuels.